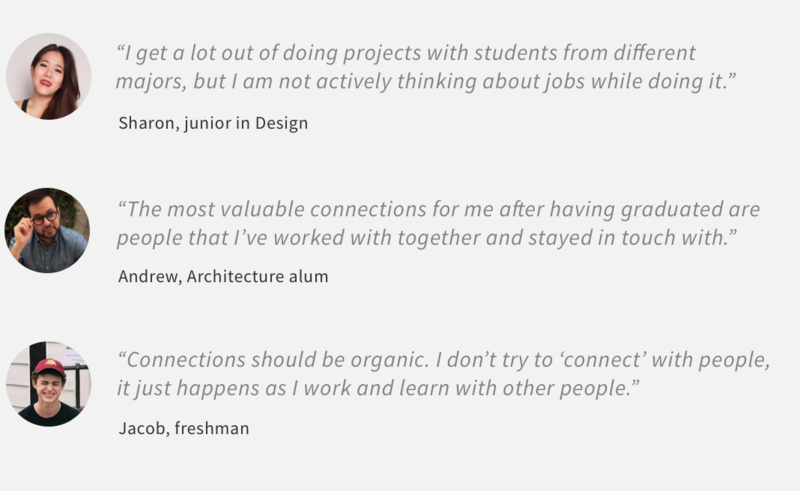 As part of my interview process at LinkedIn, I was tasked to create an experience that helps college students discover & connect to classmates, without relying on email. Through my research, I found that the main ways students build connections with each other are through extracurricular projects and organizations. I designed a prototype for a University feature, integrated into the LinkedIn students app, that helps students discover projects to contribute to based on their interests and causes, and is supplemented by events to attend and people that they already know to make the most out of their time at school. The feed works in a similar way as the main LinkedIn app, but only shows what's happening within the university network. I spent half the duration of this project interviewing sources as well as doing some investigation into current products that fill this need. 1. What is a connection? What kinds of connections are valuable to students? 2. How do students discover and connect to classmates? What are they seeking in these interactions? 3. What features does LinkedIn currently offer to help discover and connect with classmates? Are these effective, and do students form valuable connections? I spoke to current students in various majors, guiding the conversations with these questions. 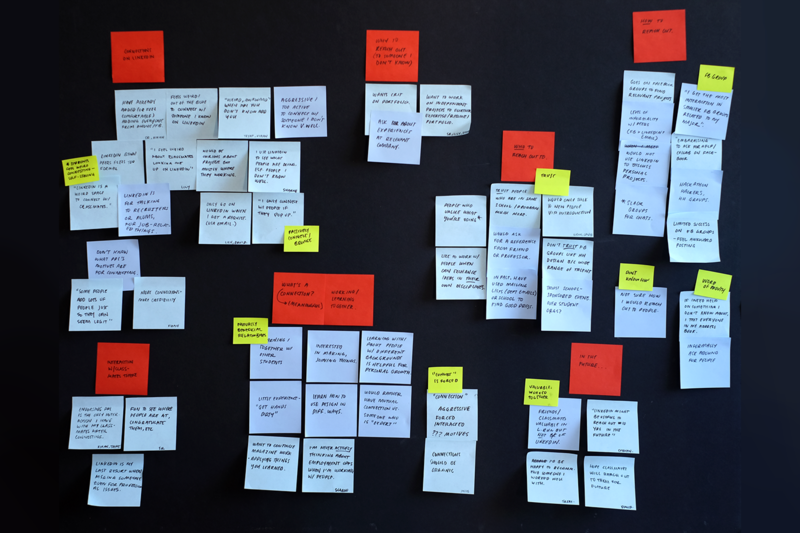 I then created an affinity diagram with post-its to organize key ideas that came out of these conversations. What is a connection? What kinds of connections are valuable to students? Students were confused when I mentioned the word "connect", because they associated it with networking, and said they weren't thinking about employment or professional development in context of their peers, although they expressed hope that they might connect them with opportunities in the future. They felt that there was a lot of value in interacting with classmates: working in interdisciplinary teams together, getting feedback, making things. I also spoke to alumni to find out what kind of connections has stayed valuable for them. 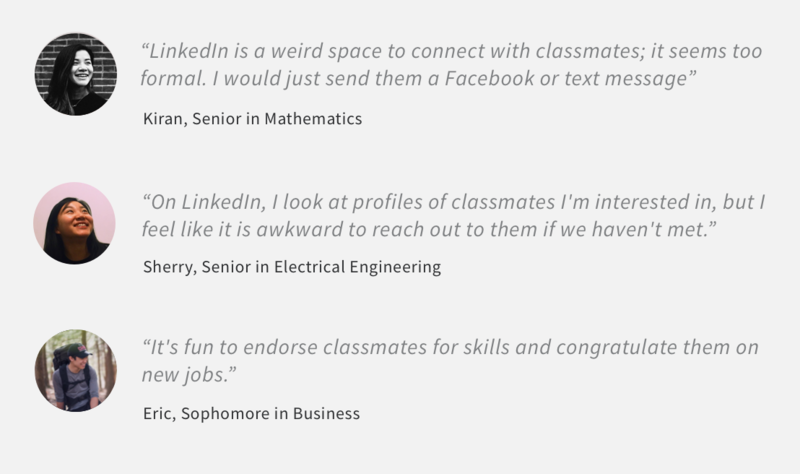 How does LinkedIn help students connect with and discover classmates? Is this effective in forming meaningful connections? Most students had a LinkedIn account, but said they only went on LinkedIn when they got a new connection request. Students are generally comfortable adding classmates that they have interacted with before, as well as with those in their mobile contacts and Facebook, though they might not seek them out actively. There's a worry of coming off as "aggressive", "awkward", or "creepy", or otherwise self-serving if they add someone they do not know very well, so there is a lot of browsing without connecting. Connections from fellow students usually come without context, so it rarely sparks a conversation. How do students currently discover and connect to classmates? What are students looking for when seeking new connections? 1. Asked friends if they knew a classmate who would be interested in a project or could offer their experiences as advice. Generally reach out by Facebook message to have an in-person meeting. 2. 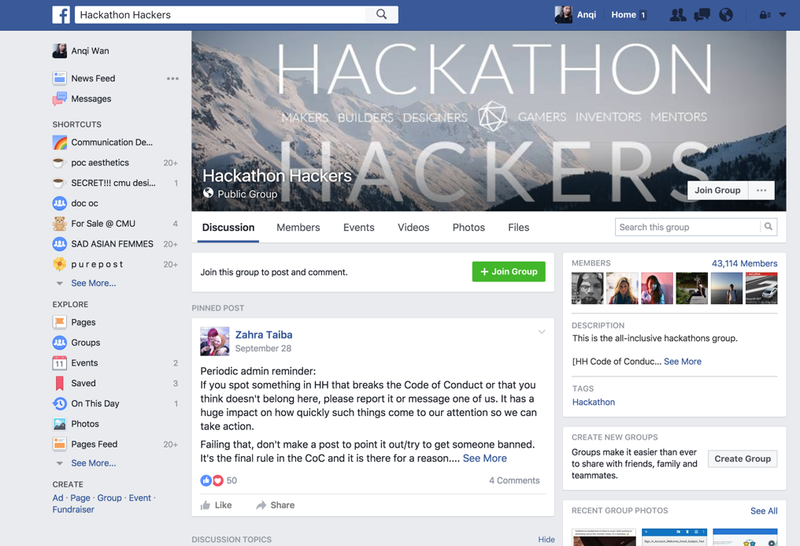 Facebook Groups: Smaller, restricted groups (e.g. internal university groups) and large public groups: students post in these kinds of groups to find people and projects to work on, as well as give and get feedback. 3. Heard about an event or project through a school-affiliated mailing list (school of computer science email list, for example). 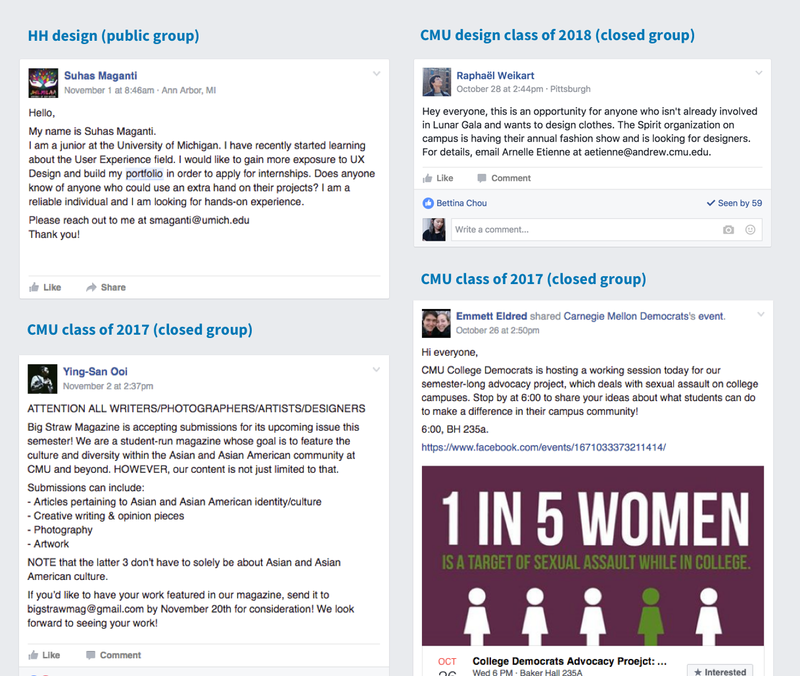 Facebook groups are the most common way that students connect with each other. These are more effective for larger groups and communication once you are in them, but there is no effective way to discover these groups. For example, I can search for groups within CMU, but these groups aren't organized in my results. There is a "discover groups" feature, but suggestions are generally open groups for a wide variety of purposes (i.e. selling items, sublets, etc). Key features were the ability to reach out to anyone for free, ability to invite others to pages or groups, and signing up for updates. Overall, there is no consistent contact method and the posts are very text-heavy, and one person is often representing a whole organization, even though they have a lot of elements in common: role(s) needed, organization/project, contact info, and further information. I wondered if I could find a more organized way to present this kind of information. 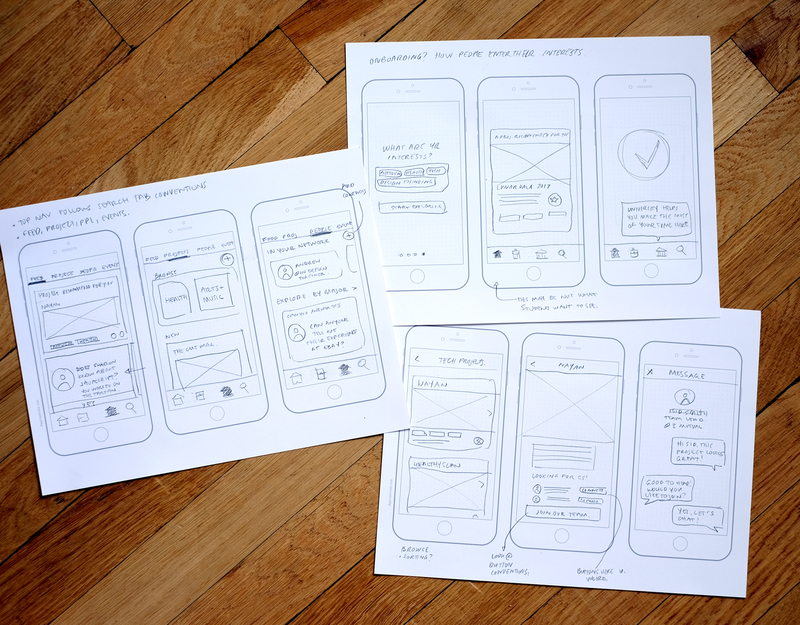 I began with sketches and paper wireframes to finally developing a high-fidelity Principle prototype. I went through some use cases and personas to make a list of features to include. 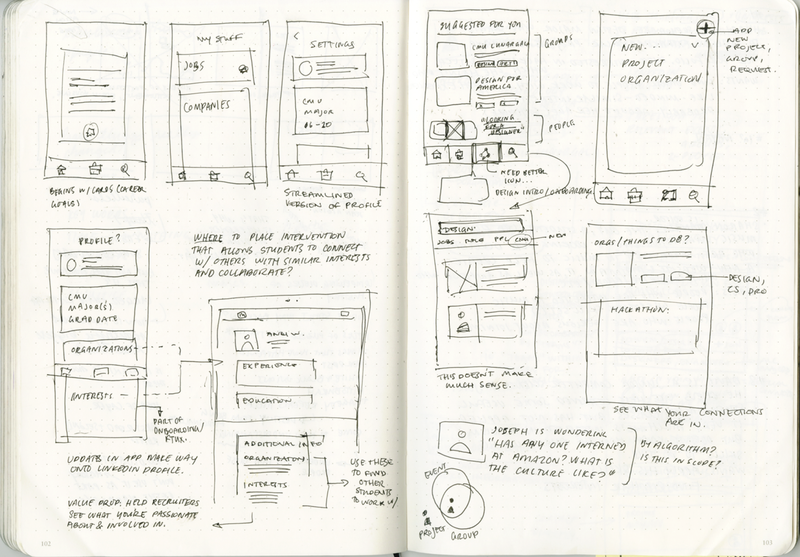 I also did some quick thumbnails of screens to help me understand the user flow and get a rough understanding of structure. I looked at different functions, like discovering people within the university, events, and projects, as well as onboarding. I decided to focus on the projects discovery with my final prototype, though the other elements like events and people are present. Here's a scenario of a student using the app. Nina is a sophomore in the Computer Science program at Carnegie Mellon. She's never had an internship before and feels overwhelmed by the whole process. She wishes that she could work on some projects to help her get more experience with applying her skills and help her develop her interests, but none of her friends are working on any. 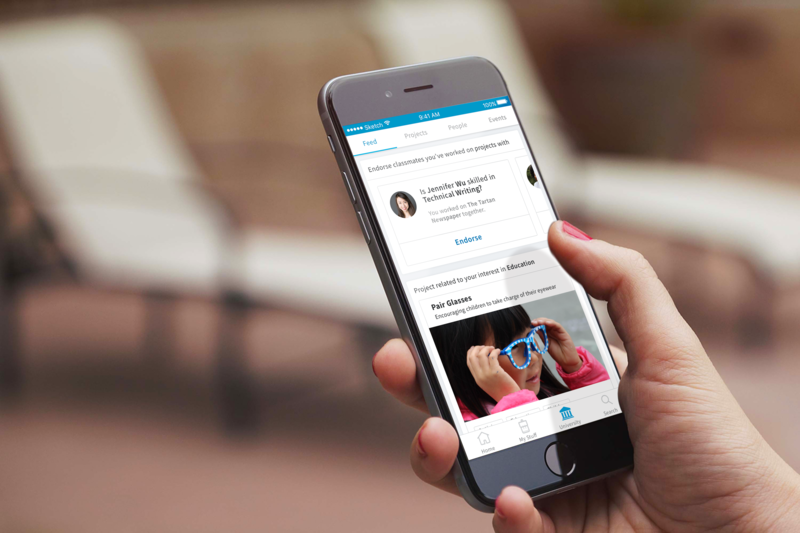 She hears that the LinkedIn Students app is a good place to look at projects going on at her university, so she downloads it. Screen 1. Nina opens her app to the university tab and it opens to her feed. She endorses two classmates that she's worked with before, and checks out the projects recommended for her. She is interested in the entrepreneurship event, so she saves it. 3. She messages Prassana, the team lead, replies to her and they decide to meet up. 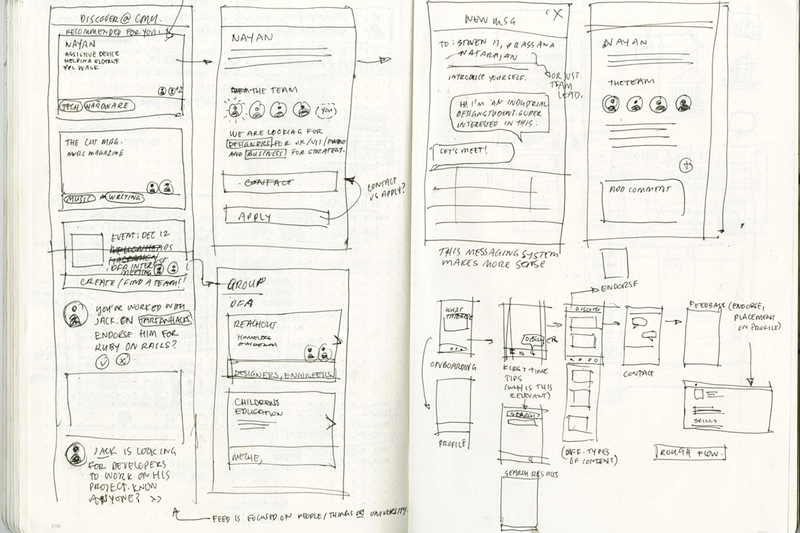 I'd explore further a lot of the concepts I played around with in my sketches and low-fidelity wireframes. 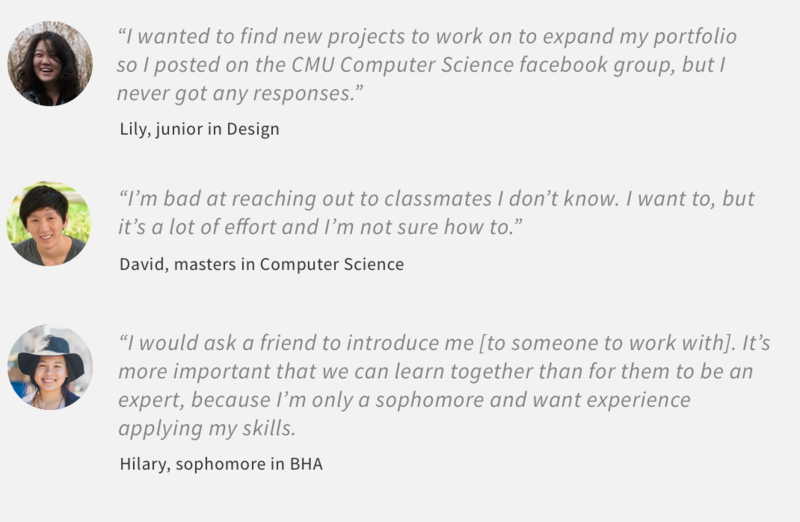 The feature is built around the idea of collaboration on projects and organizations, so I wanted to explore the idea of displaying these in students' profiles, which would be beneficial in helping students who may not have much professional experience and feel overwhelmed by LinkedIn to begin building LinkedIn profiles, which will benefit them in their job search. 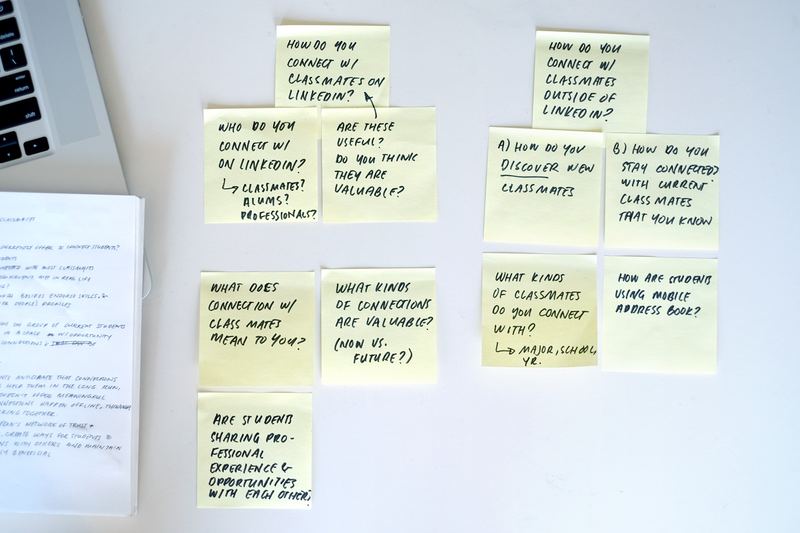 I'd also like to explore the onboarding process — to help students understand why this is a useful app and have them fill out their interests, as well as working out the event and people tabs.